As December looms nearer, Christmas is all around us. Decorations are being hung in public spaces, Christmas music is beginning to be heard, and the Christmas aisle suddenly appears in the shops. You also find Christmas picture books, especially written to bring Christmas into the literary word. These books are perfect to explore in your classroom at Christmas - bringing together the excitement of the holiday season and the real learning which comes with exploring picture books. Here's a few reasons why you should explore them in your classroom. Christmas is a time of great excitement for many children and adults alike. In the classroom, it's often the lead up to holidays, either the long summer holidays in the Southern Hemisphere or shorter winter holidays in the Northern Hemisphere. This excitement around Christmas and holidays can make it difficult for students to focus on more traditional learning. Christmas books are a great way of harnessing that excitement and turning it into real authentic learning. While students are enjoying the stories of Christmas, they can also be looking at the choices the author and illustrator make, the meanings that come from the Christmas books and the text features they use in their work. Almost everyone has some experience of Christmas - whether it's their own family celebrations, the activities they participate in at school or the Christmas they see in media. This shared experience means that students are coming to Christmas books with a significant amount of background knowledge and understanding. This makes it possible to explore the books a little deeper, to compare and contrast them with the Christmas experiences we have, to create work inspired by the books with a greater knowledge. These books then become another shared experience for students - another part of their Christmas knowledge. The idea of Christmas books doesn't always make you think of interesting story lines. But there's been some really interesting and fun concepts developing over the past few years. From exploring how Queen Victoria celebrated Christmas (in Queen Victoria's Christmas) to looking at drought at Christmas time (in the CBCA recognised All I Want for Christmas is Rain), authors and illustrators have been taking a whole range of approaches to Christmas stories and it's fascinating to compare and discuss these. Young readers can easily fall in love with characters who appear in more than one picture book. And when those characters appear in a Christmas book, there's an immediate anticipation of what that book might contain. When students see Pig the Elf by Aaron Blabey, they know they're probably going to read about some of the horrible behaviour of the selfish Pig. Or, if they look at Jackie French's Christmas Wombat, they know there's a pretty good chance that it will be written in diary format and may include carrots. 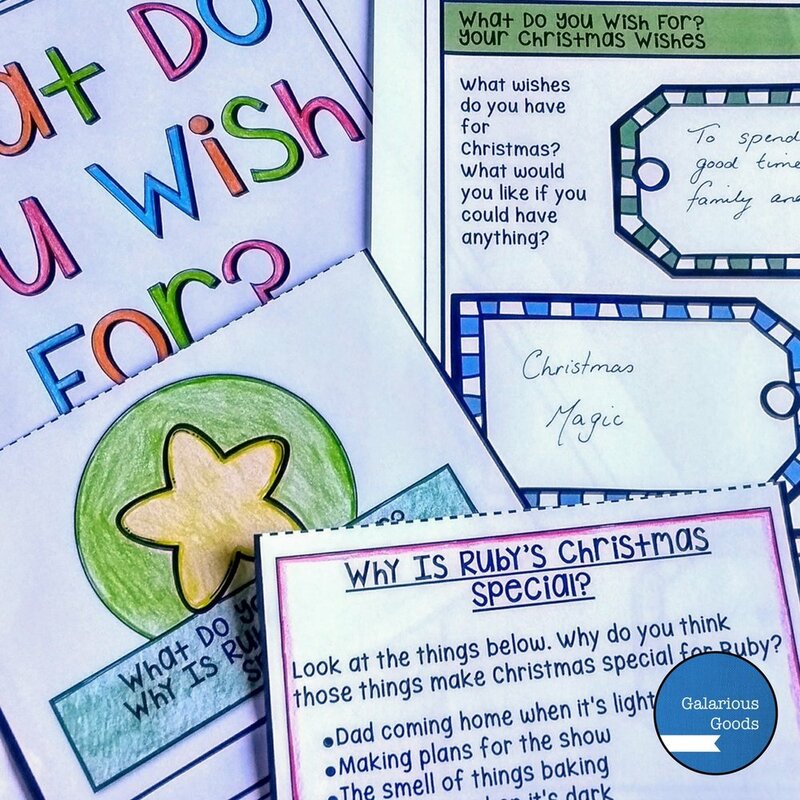 This anticipation builds excitement into lessons using these books as well as offering opportunities to explore how well known characters react to the events of the Christmas season. Christmas time and the lead up to holidays are usually some of the busiest times in the school year. There isn't always a lot of time for sustained learning. This is where the Christmas picture books can be a huge assistance - they're quick and easy to read, but there's a lot of smaller activities you can do with them. They're portable, so you can take them with you if you're moving from one activity to another and need to fill in waiting time. You can get a complete text experience, without worrying that you're going to run out of time to read a novel. Are you exploring Christmas books in your classroom this year? You can find a whole range of Christmas picture book studies at the Galarious Goods shop, including our money saving bundles - for Year 3, 4 and 5 and for Year 4, 5 and 6.